Mahindra and Mahindra have recently launched its flagship truck Navistar after the prolonged joint venture with Mahindra Navistar automotives Ltd. It runs efficiently with a power of 210 hp @ 2200 rpm and displacement of 7118 cc. Its definite awesome features include fuel efficiency, mechanical injection system and Bosch rotary pump. It has a maxforce 7.2 engine that offers maximum power even with full load. With 4 cylinders, its efficiency lasts up to 15000 hours. 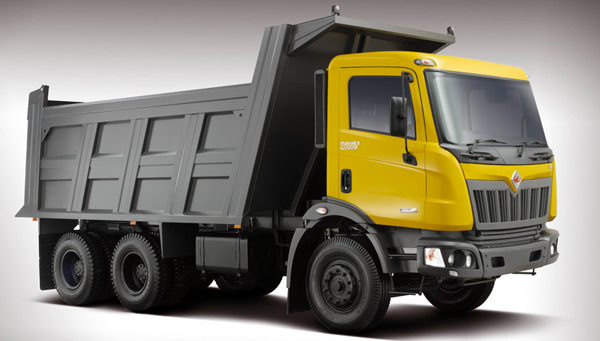 Mahindra Navistar Trucks is especially designed for running on the roads in India. Some of the main highlights include C-section ladder type chassis frame, Strong front axle with wider cross section and larger bearing sizes for longer life, Heavy-duty rear axle, Wider leaves for better safety, Specially developed parts for vehicle commonality, Customizable tippers, haulage, and trailers in various sizes, Strong and rugged Chassis Aggregates, Unique Front Axle, Extensive road testing, Wide range of cabins and so on. Mahindra Navistar Trucks uses MaxxForce Advanced EGR (exhaust gas recirculation) engines which happen to be an evolution of technology only to meet EPA 2004 and EPA 2007 emissions regulations. The [EGR] does not require drivers to find or fill liquid urea. Instead, the truck/engine manufacturers utilizing liquid urea SCR (selective catalyst reduction) technology are responsible for emissions compliance. The driver or owner of the vehicle has no role to play. We have come with a list of the full technical specifications of Mahindra Navistar Trucks. Here is what the vehicle is expected to have. Mahindra Navistar Trucks is priced at Rs. 14.99 lakhs (MN25 truck) in India.